Group Theory is an indispensable mathematical tool in many branches of physics and chemistry. 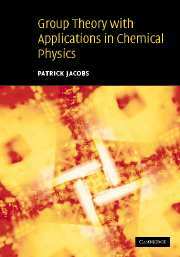 Providing a detailed account of Group Theory and its applications to chemical physics, the first half of this book focuses on elementary topics, such as molecular and crystal symmetry. The latter, more advanced portion includes proven examples. The book's comprehensive coverage makes it suitable for a two-semester course at the advanced undergraduate and graduate levels. 1. The elementary properties of groups; 2. Symmetry operators and point groups; 3. Matrix representations; 4. Group representations; 5. Bases of representations; 6. Molecular orbitals; 7. Crystal field theory; 8. Double groups; 9. Molecular vibrations; 10. Transitions between electronic states; 11. The rotation group; 12. Projective representations; 13. Time-reversal symmetry; 14. The crystallographic magnetic point groups; 15. Macroscopic properties of crystals; 16. Space groups; 17. Electronic energy states in crystals; 18. The vibration of atoms in crystals; Appendices.